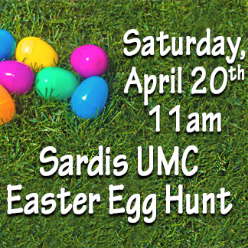 Sardis United Methodist Church will once again be hosting its annual Easter Egg Hunt on Saturday, April 20, 2019. We will begin at 11:00 a.m. on the front lawn of the church. All children are welcome to join us for the hunt, some cookies, and an opportunity to meet the Easter Bunny! Remember to bring a bag or Easter basket for collecting. This is a free event.